With 3200 employees, ETS develops, administers and scores more than 50 million tests annually in more than 180 countries, at more than 9,000 locations worldwide. ETS is a nonprofit organization that advances worldwide quality and equity in education by creating assessments based on rigorous research. They develop, administer and score more than 50 million tests annually in more than 180 countries, at more than 9,000 locations worldwide. ETS’ 3,200 employees help individuals, educators and government agencies around the world find new ways to advance learning through customized, innovative assessment solutions. In addition, they conduct educational research, analysis and policy studies, and develop a variety of customized services and products for teacher certification, English language learning and elementary, secondary and post-secondary education. ETS’ relationship with Sydney began in 1987 when the demand to catalog their various collections became pressing. ETS’ professional staff (with training and expertise in education, psychology, statistics, psychometrics, computer sciences, sociology and the humanities) produces and collects a significant volume of important content, and offering global access to these materials is imperative. The driving force for selecting an ILS was the need to provide access to their books, general library collection, archives (e.g. institutional history; conferences; papers; proceedings; writings of founding officers and key researchers, and product histories) and to their test instrument collection. At that time, SydneyPlus was the solution. Not only did it offer all the functionality, ease of use, integration and customization options required, but per Karen McQuillen, ETS’ Director of Knowledge Services, it was then the only platform with an allowable field length that could handle abstracts. This critical capability demonstrated Sydney’s deep understanding of information-intensive organizations’ needs, and a commitment to answering them. Beyond internal access, ETS wanted to make the test collection available externally, to educational researchers, to professors who teach testing and measurement in universities, and through hundreds of libraries around the world. Prior to implementing SydneyPlus, ETS had a series of print indexes organized by test subject, but the requirement to make them searchable resulted in a SydneyPlus database, developed quickly and easily by Knowledge Services staff. With direct access to the test collection database, people can see what tests are available (including non-ETS products) and learn how and why they have been developed. Another purpose-built externally facing service made possible by SydneyPlus is the ETS Authors database, which provides access to ETS’ body of work, wherever it resides. The ETS Research Department wanted to o er public access to an index of ETS authored key research. While ETS had maintained a web page providing access to its ETS Research Report series, its research published in journals or as book chapters was getting lost. 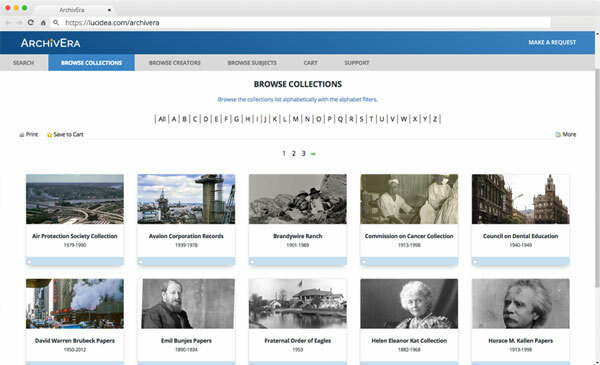 Most of the content and cataloging was already in the Archive collection, so ETS and Sydney undertook a project to extract from it, create a new database and leverage prior work. Over 500 documents formed the core of the ETS Authors database; that number has now grown to 10,000. Early adoption of innovative technology solutions is part of ETS’ corporate culture. For example, they wanted to use the Sydney platform as a public facing site, but they wanted it branded with the ETS identity…so they delivered their Sydney database content through their own website (along with relevant third party resources that they could bring in using Sydney) working in partnership with their IT department and the Sydney team to migrate their records. The migration to SydneyEnterprise has given the ETS library staff even more options to work closely with their IT department. Their combined team is called “Connect,” with the mission of connecting users with the information they need to do their work, anytime, anywhere. ETS uses SharePoint as their intranet and in addition to relying on the Knowledge Services group to help with the SharePoint taxonomy, the IT team has worked closely with library staff, along with Lucidea’s client services team, to integrate their SydneyEnterprise databases with SharePoint. This further extends the options for accessing ETS’ content and knowledge resources. While offering comprehensive access to critical content through a single venue is of primary importance, information professionals at ETS and elsewhere also prioritize independence and integration. Leveraging tools that allow library staff to administer and configure their own platforms is critical, as is the ability to integrate library databases and systems with existing information resources, including SharePoint. With SydneyEnterprise, ETS Knowledge Services staff can definitely further these goals. ETS believes in the power of education, and they believe in the power of SydneyEnterprise to support and share their research, helping them lead in the development of new and innovative products and services around the world.